Using satellite data, the European Space Agency has produced a glorious new image of the swirling spirals at the north pole of Mars. The Red Planet has never looked more delicious. This new perspective was generated from 32 individual images taken from 2004 to 2010, and encompasses an area of around a million square kilometers. Data was provided by ESA’s Mars Express and the Mars Orbiter Laser Altimeter (MOLA) on board the NASA Mars Global Surveyor mission. Like Earth, Mars features a frozen ice cap, but instead of just containing water, the ice on Mars also includes copious amounts of frosty carbon dioxide. So yes, the extreme northern region of Mars is vast wasteland covered in thick swaths of dry ice. At least, that’s the case during the winter months, when around 30 percent of all the carbon dioxide in the Martian atmosphere precipitates onto the cap, producing a dry ice layer three to four feet thick. Come summer, this ice melts, and the resulting gas drifts back up into the atmosphere, leaving the water-ice layers behind. As for those dramatic swirls, they’re caused by strong polar winds. Gusts blow from the elevated center towards the polar cap’s lower edges, and get twisted by the same Coriolis force that cause hurricanes to spiral on Earth. The Martian north pole has some dramatic features, including a 310 mile-long (500 km), 1.2 mile-deep (2 km) trench called Chasma Boreale. Scientists suspect that this ancient trench is getting progressively deeper over time as new ice deposits build up around it. 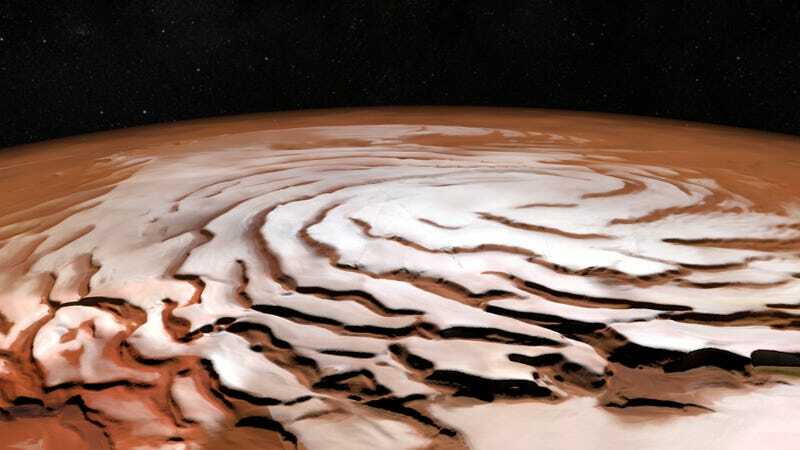 Radar observations made by Mars Express and the Mars Reconnaissance Orbiter suggest the ice cap is comprised of many different layers of ice and dust, some a mile deep. The presence of water-ice on Mars is not just interesting from a scientific perspective. It’s also important for any would-be settlers hoping to live—and have something to drink—on the Red Planet. On the whole, Mars contains a lot of subsurface water, but this water will be very difficult to obtain, especially for colonists just trying to survive the harsh conditions. Complicating matters, this subsurface water contains copious and unhealthy amounts of salt, requiring some kind of desalination scheme (again, a difficult process even in the best of conditions). The best place to obtain water, therefore, will likely be at planet’s polar regions. Which isn’t the worst. It’s not as if settlers will be able to enjoy the great outdoors on this hostile and forbidding planet anyway. Could We Drink The Water On Mars?